Yipes, I’ve been so busy with my temp job and other stuff the past week, I haven’t had an opportunity to write anything for this blog. I also ended up going to visit my parents in Connecticut, since they were pretty insistent that I begin clearing out some of the boxes of comic books I had stored in their basement. A few of the things that I took back to Queens I’m going to keep, but most of it I’ll try to sell or give away. Hey, anyone interested in any Batman, Superman, or Spider-Man stuff from the 1990s? Let me know! Anyway, coincidentally I recently finished re-reading the Essential Doctor Strange Volume 1 collection featuring the original stories of Marvel’s master of the mystic arts by Steve Ditko, Stan Lee, and friends that were originally presented in the pages of Strange Tales back in the mid-1960s. Having re-experienced those early adventures of Stephen Strange, I decided to take home with me the various more recent issues of Doctor Strange from my collection, and read those. Having just experienced those early Ditko/Lee tales certainly gave me a different perspective on the later material by such writers as Peter Gillis, Roy Thomas, David Quinn, and J.M. DeMatteis. In any case, one of those Thomas-penned issues, Doctor Strange: Sorcerer Supreme #37, was a book I wanted to spotlight in Strange Comic Books for a while now. 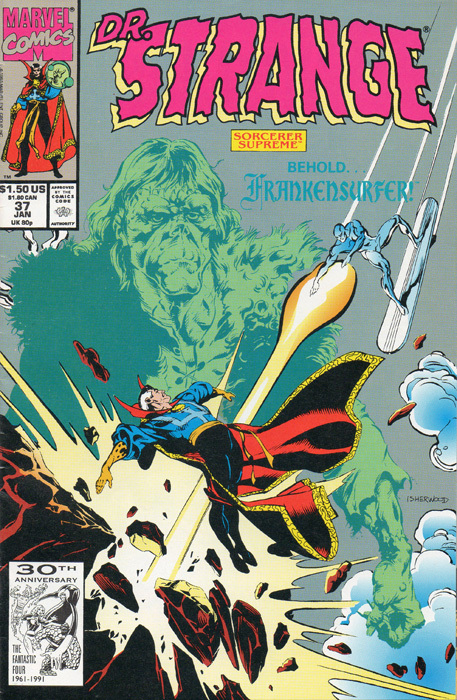 With a cover date of January 1992, Doctor Strange: Sorcerer Supreme #37 is from the writing team of Roy & Dann Thomas and J.M. Lofficier, with artwork by Geof Isherwood. The issue has the memorable story title of “Frankensurfer,” which might bring to mind images of Boris Karloff in full monster make-up catching a wave off the coast of Hawaii. But it is actually a sequel to the classic Silver Surfer #7, by Stan Lee & John Buscema, which saw Ludwig von Frankenstein, a descendent of the infamous mad scientist, created a duplicate of Galactus’ herald. On his way home after the comic events of the Infinity Gauntlet crossover, Doctor Strange is seemingly attacked over the skies of Manhattan by the Silver Surfer. Driving off his foe, the Sorcerer Supreme is extremely surprised to hear the fleeing Sentinel of the Spaceways declare his intention to return to Castle Frankenstein. Perplexed, Strange decides, instead of pursuing, to engage in a bit of research. He returns to his Sanctum Sanctorum and consults the Book of the Vishanti. The mystic tome provides Strange with a detailed recounting of the long, twisted, and bloody histories of the Frankenstein families. Along the centuries, we learn the history of the notorious creature constructed and brought to life by Victor Frankenstein. 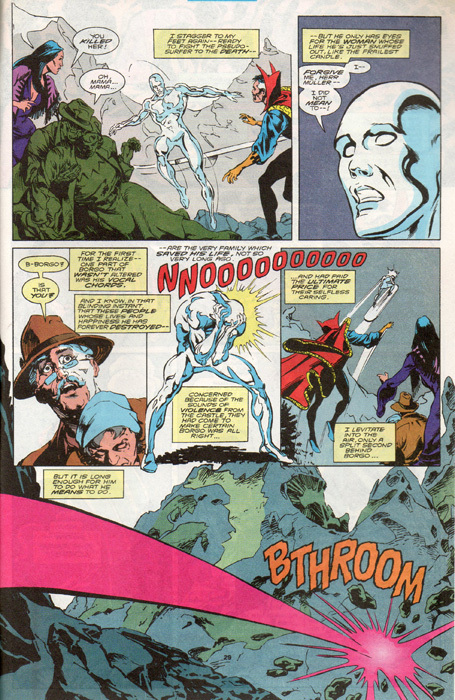 The family’s run-ins with Dracula, Solomon Kane, the Invaders (a story which I covered in a previous blog post), Iron Man, and, of course, the Silver Surfer are related to Strange. Finishing his research, Strange finally heads off to Castle Frankenstein. There he encounters Victoria von Frankenstein, Ludwig’s daughter who has dedicated her life to making amends for her family’s terrible past. 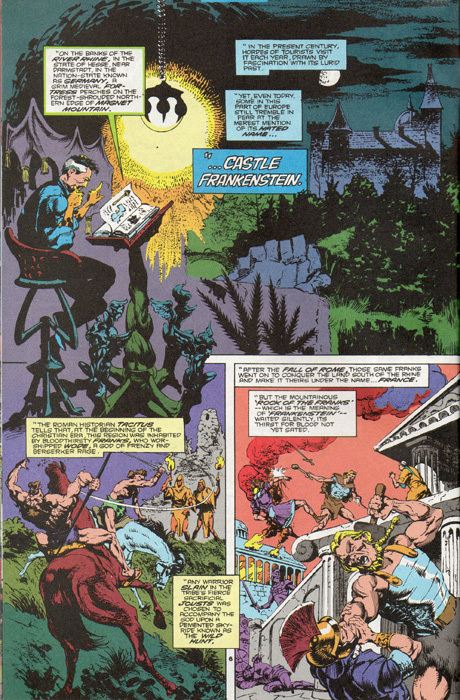 Victoria and “the Children,” the deformed results of her father and grandfather’s terrible experiments, have been imprisoned in the castle dungeons by the “Frankensurfer.” Victorian reveals this ersatz Surfer is actually Borgo, her father’s former assistant, who was horribly crippled during the events of the Lee & Buscema tale. Managing to replicate Ludwig’s experiments, Borgo became a new duplicate Surfer, and has sworn vengeance on a world he feels has scorned him. The Frankensurfer reappears, battling Strange anew. During the fight, an innocent bystander is slain. Borgo immediately recognizes her as the woman who cared for him after he almost died, one of the few people to ever show him kindness. Horrified, the repentant Borgo uses his stolen powers to fly at full speed straight into the face of a nearby mountain, killing himself. As was later explained in a subsequent issue’s letter column, “Frankensurfer” had an interesting genesis. It began life as a two part “Book of the Vishanti” back-up tale written by Roy Thomas and Jean-Marc Lofficier. Afterwards, Roy and his wife Dann then wrote the twelve page story of Borgo the Frankensurfer to frame it, making the entire story an issue-long tale. I think it works very well indeed. Roy Thomas and J.M. Lofficier do an excellent job of taking material from a variety of comic books published by Marvel over the previous quarter century and weave it into a coherent, informative, intriguing faux-history for the notorious Frankenstein family. And then Roy & Dann tie that in with an entertaining, haunting, tragic tale set in the present day, as Strange deals with the still-lingering legacies of the Frankenstein dynasty. Of course, Roy Thomas is a veteran writer at Marvel, having written classic runs on numerous titles, among them Avengers, Conan, Fantastic Four, and X-Men. So I always expect top-notch work from his pen. As for J.M. Lofficier, with his wife Randy he wrote The Doctor Who Programme Guide. Back in the early 1980s, when I was first getting into Doctor Who, in those pre-Internet, pre-DVD days, that two volume tome was invaluable in gleaming in-depth information about the early years of the series. So when Thomas and Lofficier got together, you were pretty much guaranteed a tale that was both entertaining and extremely well researched. The artwork by Geof Isherwood on “Frankensurfer” is just superb. He has an illustrative style a bit reminiscent of the Filipino comic book artists. I recall that when he came onboard as the artist on Doctor Strange in the early 1990s, it was a breath of fresh air. When seemingly every other new artist wanted to do their riff on Liefeld, Lee, or McFarlane, here was someone with a much more classically influenced look to his work. Although he had drawn a handful of the “Book of the Vishanti” back-ups, Doctor Strange #37 was actually Isherwood’s first regular issue on the title, and he stayed with the series until #59. After that he moved over to Namor the Sub-Mariner, where he also did excellent work. If you can find a copy of Doctor Strange: Sorcerer Supreme #37, it’s definitely worth picking up. Unfortunately, it hasn’t ever been reprinted, but I’m sure it can be located pretty easily on Ebay or at a comic book convention. While you are at it, I’d recommend checking out some of the other issues of Roy & Dann’s run. They did some good stories, both with Isherwood and, before him, the super-talented Jackson “Butch” Guice.